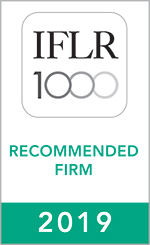 The international rating IFLR1000 Financial and Corporate 2019 recommends Ilyashev & Partners Law Firm in Ukraine, Russia and Estonia. This is the first time that the firm is listed in the international rating in all countries where its offices operate. “We are grateful to our customers for appreciating the quality of our services, including in the new markets, – says Mikhail Ilyashev, the Managing Partner of Ilyashev & Partners Law Firm. – “The success of our firm lies in professionalism and expertise of our employees striving to achieve specific and tangible results for the clients”. ∙ in Estonia – in financial and corporate law. The Senior Partner Roman Marchenko was distinguished as a leading expert in banking, bankruptcy and restructuring practice. IFLR1000 is the guide to the world’s leading financial and corporate law firms and lawyers. The first rankings were published in 1990 and currently the research covers over 120 countries worldwide. IFLR1000 focuses on two specific research projects: Energy and Infrastructure (published in June), Financial and Corporate (published in October), providing an annual overview of activities of law firms by practice areas and jurisdictions, recommendations of clients and colleagues, as well as examples of major deals. The guide is published by publishing house Legal Media Group which is the legal publishing arm of Euromoney.